Ranch, near Ramah, New Mexico. Click on any picture to see a large version. 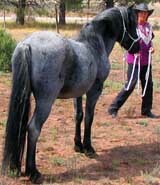 Another view of her stallion. Photos of Flair, Carolyn Bertin's mystery gaited gelding.